VFW New Richmond/St. 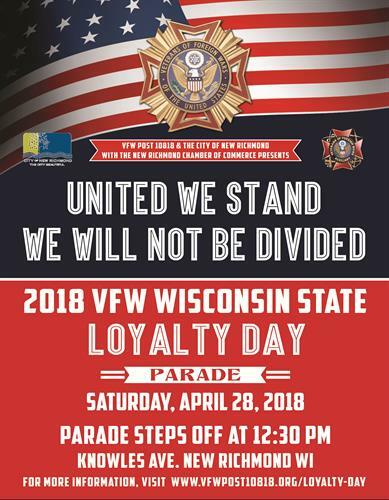 Croix County Memorial Post 10818 has been selected to host the 2018 Wisconsin State Loyalty Day Parade. VFW Posts and other organizations around the state will gather for a parade to celebrate Loyalty Day and our community of St. Croix County. After the parade, there will be a chili-feed for everyone at the New Richmond American Legion.